water quality is below setpoint. LCD Display for water quality and alarm. Isolation / Divert valves to facilitate optimum membrane cleaning. Stainless Steel high pressure piping. Stainless steel multi-stage centrifugal pump. 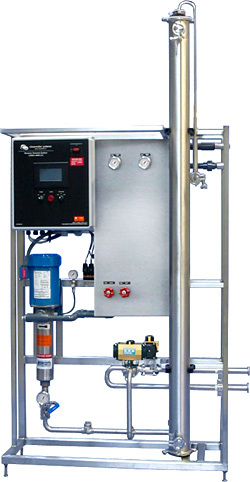 The Clearwater CWRO 4040-C series of compact reverse osmosis systems are built for medium duty applications but with many high performance features typically found only on larger units. A programmable logic controller (PLC) controls RO functions and integrates with the conductivity meter to activate and deactivate the permeate divert assuring optimum water quality. These units may be configured for permeate rates from 1-3 GPM (4-11 L/min) and occupy only 3.3ft2 (0.3 m2) of floor space.